Hillsboro’s Lane Cluff battles with Washington’s Mason Mustain on Thursday at Hillsboro High School where the Indians took on the Blue Lions in an FAC dual meet on senior night. The Hillsboro Indians varsity wrestling team celebrated senior night on Thursday, January 10, when they hosted the Washington Blue Lions in a Frontier Athletic Conference dual meet. Seniors Lane Cluff and Richard Adkins each won their matches while fellow senior Brennen Priest was defeated. The Blue Lions won the team meet by a score of 64-13. All three seniors were honored prior to the start of the varsity meet and were accompanied by their parents as they were introduced to the fans in attendance. Adkins was the first member of the Hillsboro senior trio to take the mat as he squared off against Washington’s Kalub Wilkerson in the 160 pound matchup. Adkins controlled much of the action en route to earning the major decision victory over his Blue Lion opponent by a score of 11-2. Next onto the mat was Priest who competed in the 195 pound division against Collier Brown of Washington. Priest was unable to overcome Brown and lost his match by major decision with a score of 9-0. 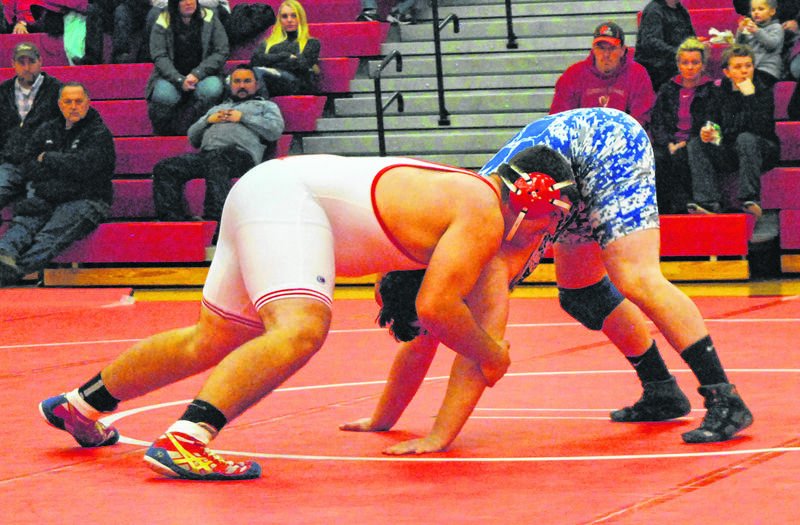 Cluff was the third and final senior to enter the circle for the Indians and he competed against the Blue Lions’ Mason Mustain in the 285 pound weight class. Mustain proved to be a sturdy test for the three time state qualifier in Cluff and narrowly missed upsetting the senior as he lost via decision by a score of 6-5. Mustain gained top control in the third period to but was unable to maintain the advantage as Cluff regained control late and scored the winning points before time expired. Adkins improved to 25-7 on the season with the win and Cluff improved to 34-1. Priest dropped to 11-25 overall. The Indians were also represented at the dual meet by Jaedan Meriweather at 120 pounds, Isaac Lewis at 126 pounds and Bryce Stanley at 132 pounds. The Indians will be back in action on Thursday, Jan. 10, when they make the cross county trip to Greenfield to take on the McClain Tigers at McClain High School in an FAC matchup.